Have you considered ASA for your son or daughter’s education? If so, we invite you to our 2017 Enrollment Open House! Join us Thursday, January 26th, 2017. 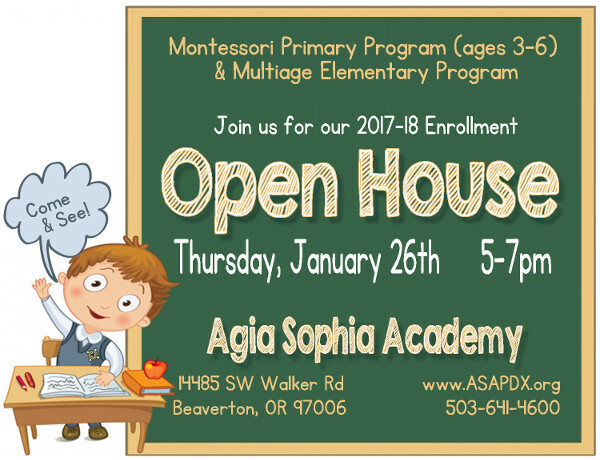 Stop by anytime between 5 and 7pm to tour our school campus, meet our nurturing teachers, learn about our excellent curriculum, and discover what ASA can do for your child! We’re the only Orthodox school in the Portland Metro area. For more information, visit www.asapdx.org. This entry was posted in education and tagged Agia Sophia Academy, open house, school. Bookmark the permalink.